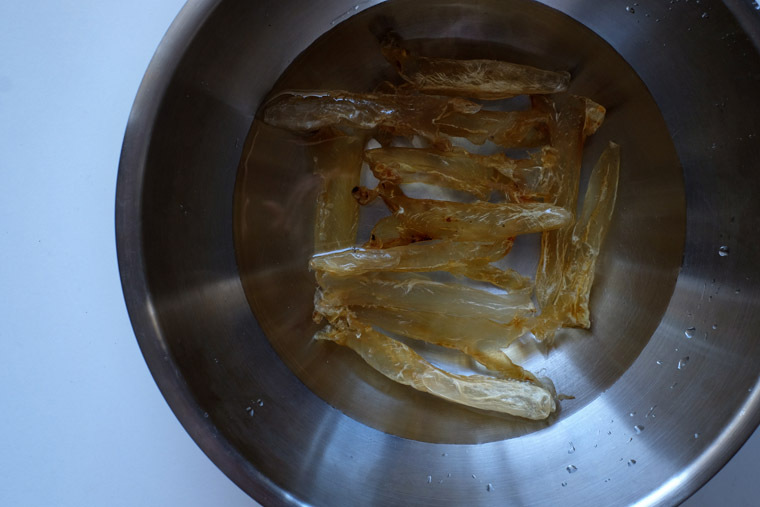 Fish maw is dried swim bladders of large fishes like sturgeon. Despite being seemingly an inferior fish product to many, fish maw is exalted in the Chinese community as a delicacy. Besides, it is a good source of collagen used in food industry to create water-resistant glue (source). It’s spongy texture allows it to absorb the flavours of other ingredients. Fresh fish maw is cleaned, dried and occasionally deep-fried. 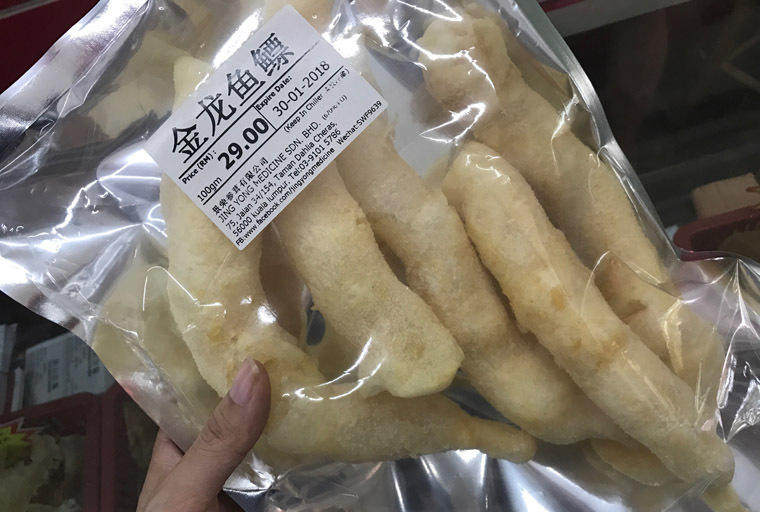 However, the owner of the Chinese medicinal shop to me that deep-frying is not recommended and no longer practiced as the fish maw will turn rancid quickly. Fish maw is dried swim bladders of large fishes. A quick search on Internet described it as almost tasteless which I disagree. 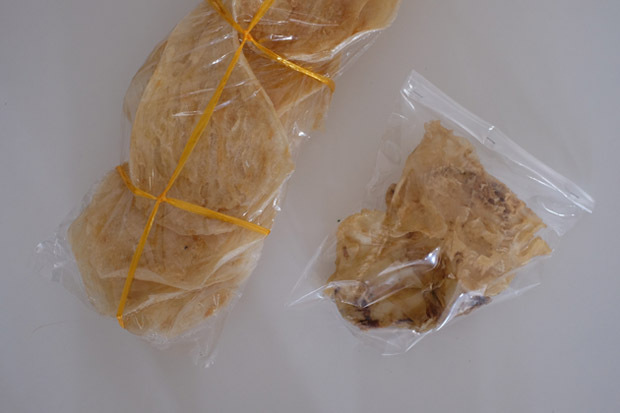 I’ve bought a few grades of fish maw from Kuantan and Kota Kinabalu (both famed for seafood produce) and noticed that higher quality ones smell and tastes significantly better. It has this interesting sea flavour which is described as xin mei/ xian wei ( 鲜味) in Chinese. 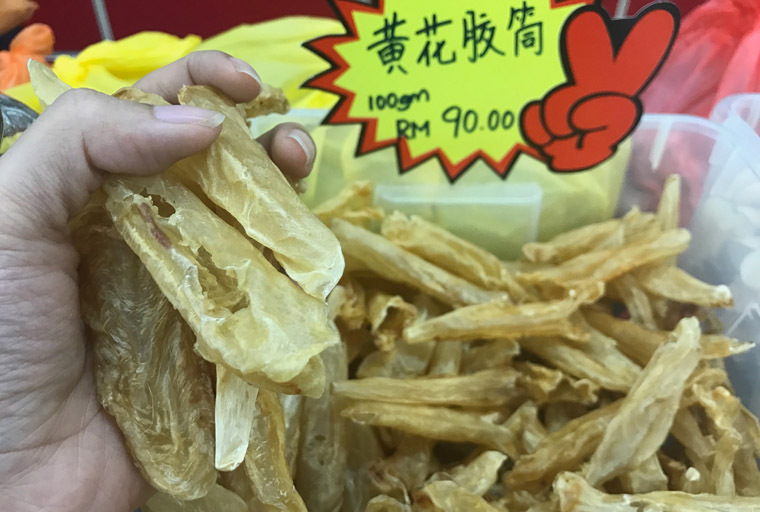 Fish maw is more affordable than shark's fin and bird nest. However, it is not inexpensive. It is divided into two grades. Yu Piu (魚鰾) is the lower grade which you can get for about RM 30 for a hundred grams. Whereas the higher grade Fa Gau (花膠) can cost RM 300 for the same weight! This piece of fish maw (Fa Gau/花膠 ) costs RM 400+! 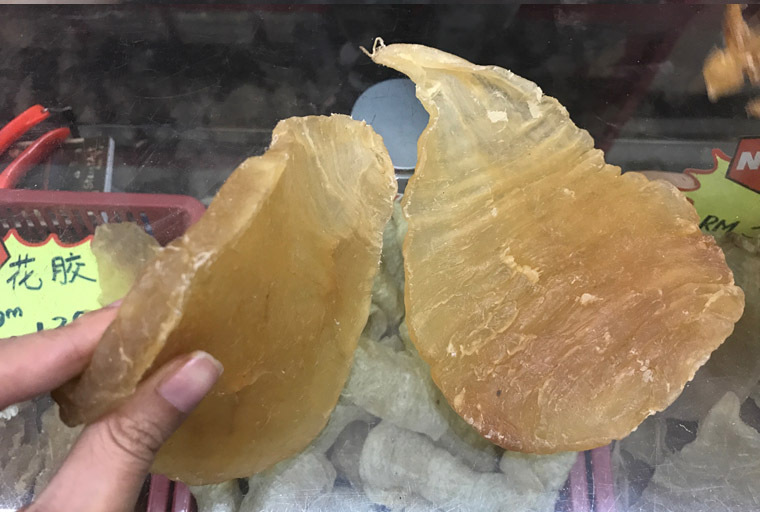 Higher quality fish maw is much thicker and is valued for its collagen. My late grandmother used to spend thousands on these delicacies during Chinese New Year. However, I, the younger generation of Chinese think it's a little too pricey. Thankfully, I found intermediate quality fish maw. At RM 90 per 100 g, I could make a pot of soup for 12 people. I think it's not too bad. To prepare, rinse fish maw. Then soak them in a large bowl of water. There should be enough water so there's room for the fish maw to expand. Soak until soft (about 2 hours). Then cut into smaller pieces. Fish maw cooks quickly and normally only added to soup when its almost ready to be served.